Boonsom Spirulina Farm located in the southern part of Chiang Mai province is the largest producer in Thailand, with 40,000 square meters of growing pond area, and is ISO 22000 Certified. 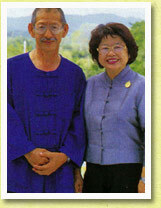 The pioneering founders are Professors Jiamjit Boonsom and Somchye Boonsom. Beyond making Green Diamond natural food supplements, Boonsom Farm offers visitors an inviting Agro-Tourism program. 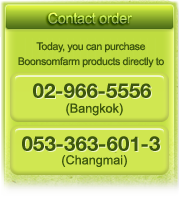 At Boonsom Farm you can learn how spirulina algae is grown, harvested and made into finished products. Plus, you can experience delicious food made with spirulina and enjoy a spirulina facial spa treatment. The average daily temperature is 30 degrees Celsius throughout whole year in an area of pure air without pollution. The water for cultivation comes from an examined area assessed to have standards accepted by the Metropolitan Waterworks Authority (Thailand) certifying the water is clean for drinking. The total manufacturing process is of very high standard from the stages of cultivating, harvesting, water filtering, drying in oven at 70 degree Celsius, crushing to dust, filling pellets and pressing capsules in sterile room and finally always checking the material under certification of the Food and Drug Administration. Spirulina, a high source of nutrition, is found throughout the world. The usage of Spirulina has spread to the public from its discovery by a tribe on the continent of Africa. The tribals have sustained their lives by consuming one kind of algae which the local tribe called �Dihe�. They use baskets to collect the algae from the lake�s surface, sun dry, crush to dust and keep for food preparation. The anthropologists who discovered this tribe were curious about how their population existed due to the tribe�s insufficient intake of meat protein while they still continued to live without any physical development problem. When the scientists undertook research, they found out that people of this tribe consume Spirulina which gives them high nutrients to maintain their body. In Thailand, Spirulina was found at Ubonrat Dam in 1966 by Ms. Jiamjit Boonsom, an academic scholar of Department of Fisheries. The research on Spirulina was seriously started in year 1983 receiving its main support from Food and Agriculture Organization of United Nations (FAO) under the project of "Development of Microalgae (Spirulina) Production of Thailand". Research on this specific type of algae indicated the high nutrient value in this food product that cannot be seen by naked eyes. This research has been supported and funded by the Food and Agriculture Organization of the United Nations-FAO (of USAID) and by the Chulabhorn Research Institute. This type of Spirulina has very high protein of 60-70%; moreover, it contains high vitamin content such as vitamin A, vitamin B1, vitamin B2, Vitamin B6, vitamin B12, Vitamin C, Vitamin E and Vitamin H, Folic Acid and Nicotinic Acid. It is found that Spirulina has a vitamin B12 resource about 250% as found in liver. Beta carotenes provide vitamin A around 20-25 times as found in Carrot. Moreover, there are many types of minerals such as iron, calcium, magnesium, potassium which have three times of iron and three times of a beef steak. Importantly, it has the element of amino acid which balances the line up in suitable proportions of more than eighteen types. Interestingly, it is also the fatty acid resource of GLA.